Thank You Sir Chris Arnold! Enthusiasm and Excitement was creeping out, as we walked inside, we felt that we deserved this day, and the ambience there was soothing and professional. Chairs and table were perfectly placed, pink and white flowers made up a fresh atmosphere at every table, the brochures and feedback forms were neatly placed, the lighting brightened and changed the look of the entire place, and most importantly our star of the day i3 – Influence, Inspire, Impact, stood Majestic on the stage in between the brown stylish leather chairs. The waver structure of the roof, made us get the waver feeling. In nutshell, JW Marriot, Grand Ball Room, made us feel special! A long wait was coming to an end, as Sir Chris Arnold, was outside the ball room and posing for few pictures, the whole audience were enthralled to listen, that Sir Chris Arnold would come in any moment, and then it was time for Sir Chris Arnold to enter the ball room, as Sujit lalwani sir, who is the founder of i3, which inspires Entrepreneurship and encourages volunteerism, Invited Sir Chris Arnold on the stage, the audience welcomed this person with a standing ovation and thunderous applause poured in, and every face was eagerly awaiting to listen to the story of this person. Belief - We all rotate around 360 degree problems of life, but we forget to identify the root cause, that is, the radius of the 360 degree problems. And that radius is Self – Belief, once this is sowed, 99.99% of the problems will be solved. Whether it's poverty or Gender Discrimination, if one instills self - belief, then that person shall find “n” number of ways to come out of problems. Vision of 'borderless world' - I found that, this vision shall not only cut down the borders politically, but it shall even erase the borders in human mentality and “Intolerance”, will see destructions from roots. This vision shall sow the seed of real humanity and prosperity in the world. Importance of mentor - Often we feel that we are acquainted with all the knowledge in the world, and that we don’t need any one who shall guide us, but when we get stuck at a point in life and don’t move further and make big in life - then we understand the importance of having a mentor in life, it's better late than never in this matter, as mentor can be that torch light, until we find sunrise in our lives. These 3 lessons were something that moved me and I felt happy to be an ardent follower of these lessons, and from today I believe more in these lessons. Time and again these lessons prove to bring revolution in mankind. 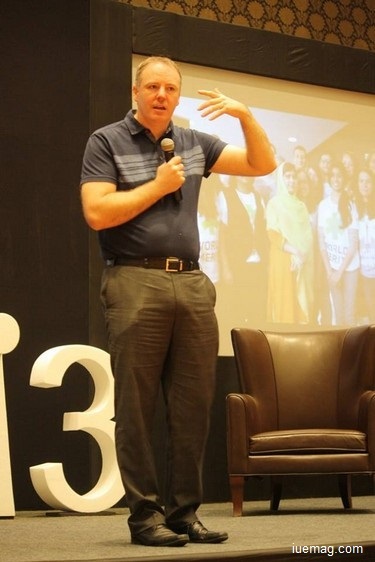 Thank you Sir Chris Arnold, your presence at Bangalore #i3 conference made me believe more in the lessons that I till date subconsciously follow. And thanks to my mentors Mr Sujit lalwani Sir, Mr Bharath GC Sir and Mr Kunal Taswala Sir, to help me realize these lessons and to have helped me keep going whenever I was stuck. After the talk was the Q&A session, where the invitees got a chance to put across the questions to Sir Chris and with all patience and Clarity, Sri Chris replied to them. Then was the Presentation of Ms. Sneha Chandrashekar, who is the founder of Black and White Tech writing solutions, she spoke on Gender Equality - #WeRiseForHer, which is one among the 17 global issues that merit 360 would tackle. Then was the most awaited launch, the dream of iU and i3 that is iU SPEAKERS. Few conferences are ment to be investment in life and thus the conference of #i3 is a Fixed Deposit, before we face challenges, we get to know the solutions to overcome, which makes us strong to overcome any situation in life. I once again thank Sir Chris Arnold for igniting the spark of true humanity, with his love for mankind and to explain the real meaning of living life, who came down to Bangalore to shower his knowledge of entrepreneurship and importance of volunteering. And thanks to the founder of #i3 Mr Sujit lalwani Sir, who made this dream of entire i3 family come true.